There can be nothing more rewarding than knowing that you are making a difference in someone’s life. Here is an opportunity for you to volunteer at one of our nearby Centers – in Hanford, Tulare or Visalia – to spend quality time with our seniors. General Volunteer – Assist with activities, decorations, games or outings. Adopt a Grandparent – One of the most heart-warming programs offered. People can make a difference in a senior’s life through our grandparent program. Community Group Involvement – We encourage churches, schools, scouting programs, and community groups to get involved. If your group wants to make a difference, contact us. 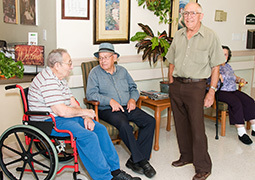 We can help create a program that will be meaningful to your group and our seniors. Please use the form below to inquire about our volunteer programs. Which volunteer program interests you? General volunteer who assists with activities, decorations, games or outings. Which area can you volunteer in? Which method of contact is preferred?